The panda is a well-known symbol of Chinese culture, especially as it pertains to the rest of the world. But the people of China have long admired all types of bears in addition to the panda. Bears have various symbolic meanings in Chinese culture. Look at jade objects, pottery, lacquerwork, bronze equipment, sculptures, and bronze mirrors of the Han Dynasty of 206 B.C. to 22 A.D., and chances are you'll see they're decorated with bears. That's because people of that period worshiped the bear and honored him by putting his image on many objects, according to China Daily USA. In fact, in China the bear became a totem, an animal with spiritual significance, and served as an emblem to embody that quality. The bear wasn't always the preferred totem of China. Emperors prior to the Han Dynasty used other animals symbolically. In the Shang Dynasty, the totem was a bird; the Shu emperor used the silkworm as his personal totem. The dragon was also imbued with significance. But it wasn't until the Yellow Emperor built his capital at Xinzheng, a place with some bears, that he became known as the Bear Emperor. China's panda bears are world-famous. These cute, cuddly black-and-white bears, who are slow-moving and who love to eat bamboo, are known to zoo-goers in major cities around the world. Their symbolic meaning is attributed to their laid-back personalities. According to the Universe of Symbolism website, pandas are a symbol of slowing down, of stopping trying to multitask. 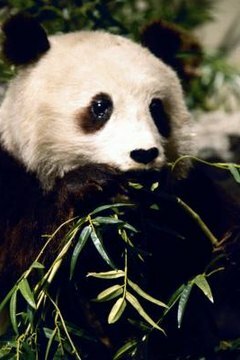 Pandas are also associated with bringing abundance and prosperity, and they represent being carefree and conservative. The bear is important to the concepts of feng shui, the Chinese art of harmonizing humans with their environments. According to this philosophy, a bear represents masculine energies, and placing a figure of a bear in the home -- particularly the main entrance -- helps to protect the house and its inhabitants. Also, placing a bear's image in the part of the home where children might reside helps parents to give birth to strong, healthy baby boys. Traditionally, eating a bear's gallbladder and bile was said to have medicinal powers. Unfortunately, bear farming, which uses some 10,000 Asiatic black bears to harvest medicinal bile and which generates almost $1 billion a year, is China's "most brutal operation," according to Peter Li, China Policy Specialist of Humane Society International. However, Dr. Li says beliefs about such animal cruelty is slowly beginning to change with the rise of animal welfare organizations in China.